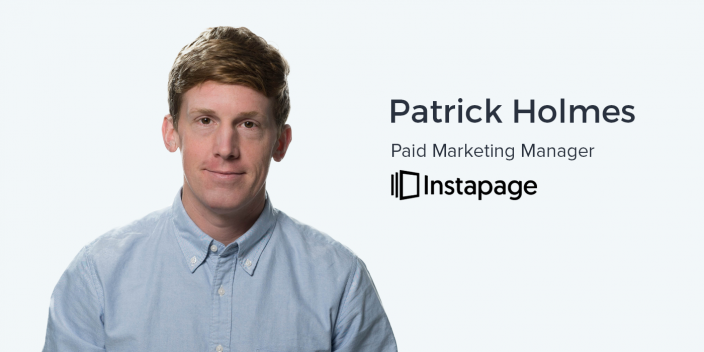 Pat Holmes is in charge of the paid media and digital advertising at Instapage. After joining Instapage in late 2015, Pat scaled out and optimized the Instapage AdWords account. He also expanded the Instapage paid acquisition program to include social channels including Facebook, Twitter, LinkedIn, and Quora. Previously Pat held a similar role at Tightrope Interactive, a digital marketing firm that offers a full-service media buying, lead generation, and other growth services. Like many Instapage team members, Pat is certified in AdWords and is also an integral part of the marketing team as a writer for our blog and active contributor with his insights into product development. When marketing a marketing, or specifically advertising, SaaS product to other marketers and advertisers as your target users, they are very likely aware that they are being targeted, segmented, and treated according to a defined set of criteria the ads manager is running in the advertising platforms. However, the advertising still works. Just because marketers know what you’re doing doesn’t mean you can’t demonstrate a unique value proposition in your ads. In fact, it’s more likely that you understand their pain points and can deliver a more effective message. There is a lot of consumer marketing that consists of tricks and, in some cases, even deception to convince someone to make a purchase. While this may not apply to sophisticated consumers in a specific niche, it’s definitely applicable to products that have millions of potential users. B2B products and products designed for experts in their field, however, rely on factual and accurate knowledge in or to be convinced of making a purchase. It is always best to be authentic. Advances in technology have not only made it easier for marketers to target specific audiences. It’s also made it easier to for us to research trends in marketing and generate new marketing best practices. “Where the ads are and how messaging affects how people browse or how people recall ads. So that’s really cool. I don’t know if that’s really macro where marketing is moving, but I think the fact that there is such a huge amount of data and a huge volume of people looking at advertising on those branded platforms will have a large influence on where marketing goes and it’s interesting to see that in action. It’s very interesting to see that research going on in action. The sheer volume of data available to advertisers now has the potential to inspire new platforms, fresh workflows, and even new MarTech companies that will continue to revolutionize the industry. Ander: Here at Instapage that we have so many experts in-house at Instapage, and that includes our CEO, Tyson Quick, and our VP of Marketing, Sarayna, who have been both featured on this podcast in the past. But there are so many other influencers here at Instapage that we are going to start featuring them every so often in an episode. And today we’re talking with the guy who runs all of our digital advertising campaigns, Patrick Holmes. Patrick, thanks for taking the time from your very, very busy schedule to come and talk with us. Patrick: Thanks for having me. I’m excited. Ander: Welcome. So Pat, you run paid media here. What is your exact title? Patrick: Paid Marketing Manager. I generally introduce myself as Advertising though because they kind of mean the same thing. Ander: Let’s hear about what your job consists of and what you’re focused on doing here at Instapage. Patrick: Sure. At first, I basically focused on AdWords. It was a smaller company, so the marketing team was, including the CEO, six people before I came on. The CEO was doing all the digital advertising and obviously he had a lot of other stuff to do as well, so I took AdWords off of his hands and expanded it, optimized it over time and did a lot of trouble-shooting. I’ve basically been running that ever since for almost two years now. Over this time, we have expanded quite a bit into social including Facebook, Twitter, and LinkedIn, as well as, more recently, Quora. Ander: They just opened up to pretty much everybody. Patrick: They just opened up to pretty much everybody, so we’re doing that as well. Bing ads as well but that is pretty low volume because we’re kind of marketing in martech-centered audience and demographic and they usually, in my experience, use Google a lot more to search for things. We also expanded our design team as we expanded the entire company, so I was able to do social advertising a lot better over time. Before, it was finding stock photos and putting them into advertisements and then realizing that three other companies are using that stock photo as well. It’s also a little embarrassing. It’s great now being able to actually work with a whole design team that’s dedicated to not just advertising but in general marketing. We have a great video team as well. For a long time, they’ve been producing really good video assets and I’ve been able to put those up on YouTube, Facebook, and a little bit on Twitter. Because they are such high quality they get really rich media high-value propositions in front of people all over those networks. More recently, I have been able to interface with the video team a lot more to get much more specifically advertising-oriented and not just a general value proposition-oriented video, so look out for a lot more growth in advertising and rich media soon. Ander: Yeah, certainly. And I want to talk about post-click landing pages and how they work with what you do as our Paid Marketing Manager here at Instapage. But let’s hear about your experience prior to Instapage as well. You worked for an agency, correct? Patrick: Yeah. It was more like affiliate marketing but you could call it an agency because we did marketing for other organizations. post-click landing pages were a huge part of that job. It was affiliate so we were driving direct action from search and some Facebook as well. There was not much of a marketing funnel there. People were looking for a keyword like ‘online colleges.’ We would serve an ad on the search engine. They would come to our post-click landing page, go through our forms, and then we were basically done with them after they submitted. We sent those leads to online schools and they contracted with us and paid us per qualified lead. So we still got data back from them about quality and then I associated the quality leads with the keywords or the sources they came from and optimized that way. But basically the whole business was run on post-click landing pages and I think we actually searched for products like Instapage but I did not know of the existence of really the industry or this company at that time. We had developers and designers in-house at that company. And they were good… I say that and you can already hear the caveat. Haha. Patrick: They were good but there were two business units and the other business unit was higher revenue so many more resources were focused on that one. Also, their post-click landing pages were far less complicated to make so they focused resources on that for that reason as well. But I really became frustrated over time. It was a huge frustration for many of us in marketing, including the turn-around time for design and development of post-click landing pages, which is troublesome because you can change text ads, bet on different keywords, and optimize that, but there’s only really so much you can do. A lot of the creative work and a lot of the new features, a lot of the focus of education, what happened on the post-click landing page itself, on the site or the post-click landing page took much more work. It’s an entire page with copy, creative assets, layout, and forms. There’s a lot you can do there to test and optimize and improve your campaigns. Ander: There’s a lot of work that goes into that. Patrick: There is a lot of work. Ander: Especially when you’re coding from scratch. Patrick: Yeah, so that’s what it was when we had our designers and developers update these post-click landing pages with different tests and whatnot. It always took a long time. One instance that I speak to often is I requested a drop shadow on a form that was just a white box and I wanted to make the white box slightly more visible and test if a shadow around the box helped conversion rate. That took a month. Ander: That took a month? I mean, that’s a matter of simply adjusting a tiny bit of CSS or HTML. Patrick: Yeah. It wasn’t that they were incompetent; they were focused elsewhere. But, the long turnaround time for this was really frustrating. That business unit unfortunately did not succeed so that led me to looking for another job and this is how I came across Instapage, which I became really excited about because the company basically solved all the problems I was having at my previous job. It’s very easy to promote a product that you actually love, that you actually would use in your own job. It’s great. Ander: How important do you think that is to your job? In many cases you’re writing a lot of the copy for ads, you’re making creative decisions on what images you’re using, and many times you’re contributing to the content on those post-click landing pages. How important is it that you are a subject matter expert in the product that you are advertising? Patrick: It’s very important. So, in my last job, even though you try to not let it, the frustration does bleed a little over into your attitude outside of work sometimes. When I leave work here and I’m actually doing something that I can get behind, I can take my mind off of it fairly easy if I want to. Or sometimes I come up with ideas for things at home and that’s actually exciting. It’s great to be able to sit at home and not be angry that you’re thinking about work but actually be excited that you’re thinking about work. Ander: I have experienced that as well, as someone who’s been in marketing and I’ve never been a marketer who markets a marketing product to other marketers, you know? Haha. Is that something you think marketers should try to engage in at least once in their career? Patrick: Yeah, I mean, it’s hard to come across a very specific job like this that you’re doing something for other people that do the same thing that you do. But yes I do. Patrick: Yeah! But marketing to marketers is also really cool because I know what I want so I can speak to that in advertisements and probably hit on some other marketers’ desires. It makes my job easier, which is great. I really enjoy it, yeah. Ander: Is there any times when you’re marketing to marketers that you’re thinking, ‘Well, they kind of know the tricks that I’m using here’? Ander: I had this conversation in a previous episode actually with Olof Mathe, the CEO at Mixmax, about email automation. When you or I sign up for a SaaS product and we’re in the on-boarding process and they’re trying to nurture us, we’re well aware that they’ve segmented us in a very certain way and we’re well aware that the personalization that we’re experiencing is automated in many cases. How does that affect what you do? Patrick: I think there’s two parts to that. The first is even though they know that they are being advertised to and they’re being promoted to, advertising still will have an influence on them. And also it’s a product that is actually helpful to them. Even if they know they’re being advertised to, if it’s a good product then it doesn’t really matter. And the second is that, it doesn’t make it easier, but it makes it more simple because I can’t so I don’t have to come up with neat little tricks to get people to do things they don’t want to do or anything. It’s not about that. It’s more about speaking maturely to an individual and that individual’s needs, trying to find a way to make this person’s life better in this situation by making their job easier. Ander: Do you think there are too many marketers that are relying on tricking someone into using something instead of actually demonstrating a unique value proposition? Patrick: In business to business, I don’t really think so, no. There’s a whole array of consumer marketing though. Some is really good and some is the typical used car salesman-type stuff. Patrick: So business to business and business to consumer is a lot different in that. The messaging is a lot less difficult and a lot more about user needs and education. In business to consumer, you do see some super corny TV advertisements and whatnot though, and your reaction may always be like, ‘Who does this work on?’ If you actually do some research it works on a lot of people. I guess if that works then people are still using it. You’ve got to know your audience. If you have a sophisticated audience that’s doing business and are experts in their field, you’re not going to trick them into doing something they don’t want to do. But if you have a huge demographic of millions of people and some of them may not be as exposed to marketing and advertising, then you might be able to trick them a little bit more. But thankfully I don’t have to do that. Ander: Right. And also, in a perfect world you won’t have to do that anyway. Patrick: Yeah, absolutely. Working for a product that sort of sells itself is great. My job is more just to make a lot more people aware of it and educated about it and not necessarily hard sell it. Ander: Let’s shift gears a little bit and talk about post-click landing pages. Even though we work together, I have not genuinely heard this story from you before. When you started using post-click landing pages and actually had a page for every single ad or every single campaign to whatever degree was possible, how did that change what you were doing and how you approached your AdWords, Facebook, or any other cost per click advertising? Patrick: I could just test things much more quickly. I could expand the amount of post-click landing pages I had much more quickly. Ander: And what are the benefits of that? Patrick: I didn’t actually realize how easily I could just copy pages and put a little bit of a different value proposition on them until maybe like two or three months after I was using the product. And that was really cool. So very early, one of the easiest things to address there is basically just post-click landing page relevance. The three elements of quality score that’s attached to keywords in AdWords are post-click landing page relevance, ad relevance, and expected click-through rate. Expected click-through rate has a little bit of a stronger effect than the other two but they still improve one of the others. There’s basically three states that they’re in and improving one of them by a state will still raise your quality score by one or two points, depending upon where it is. post-click landing page relevance is pretty easy to address when you can copy post-click landing pages because some of the common phrases that people might use to search for a platform like Instapage are, ‘post-click landing page,’ ‘squeeze page,’ ‘page creator,’ to ‘post-click landing page builder.’ I could take my main post-click landing page that is for the keyword ‘post-click landing pages’ and just copy that and change every instance on the page that says ‘landing’ to ‘squeeze’ and advertise on the ‘squeeze page’ keyword. I believe within the week that raised the quality score by like two or three points. Patrick: Yes. For sure. It’s not only direct ROI but also you can increase the volume of searches that your ad shows up on pretty quickly too. It’s great. Pat, we are just about running out of time, but there’s one question that I want to ask you which I ask to everyone who comes onto this podcast as a guest but I’d like to frame it in a little bit of a different way. And the question I ask is, where is marketing headed? What does the future of marketing look like as a whole? But more specifically with you, I’m curious about what you think about that question in the context of your role. What you think the job of someone running paid media campaigns looks like in the future? Patrick: That’s a big question. Ander: That’s exactly why I ask it! Haha. Patrick: If you are to believe the AdWords representatives that I talk to all the time, it’s mobile. That’s actually true with Facebook and AdWords. It’s all mobile. But I think that’s just partially true but it’s also a bit of a pitch to get people that aren’t advertising on mobile to advertise on mobile so that they have more ad money. Patrick: And they had three different treatments for this and they found that the one that just started up like silly and crazy when branding didn’t show up for fully twenty seconds performed the best. People just shut off the other two because this was entertaining and fun at the beginning on mobile. People continued watching it until through to the branding and I think there was higher ad recall and higher brand recall afterward for that one as well. Mobile is interesting because it’s a different medium. It’s a lot more of people’s focus than TV or banner ads would be. And, I don’t want to speculate about Snapchat’s market cap but a big reason they’re being successful is because people are focused completely on their phone when an ad comes on, so the ad will have a much higher recall with them, and much focused. It’s fun to talk about all kinds of technology and whatnot, but another thing about digital is the amount of research that can go into advertising now because of huge conglomerates like Facebook and Google and YouTube together and the amount of data that they have. It’s super interesting because, on a much larger scale, you can measure things like ad recall, do lift tests, really measure ad frequency, where the ads are and how messaging affects how people browse or how people recall ads. So that’s really cool. I don’t know if that’s really macro where marketing is moving, but I think the fact that there is such a huge amount of data and a huge volume of people looking at advertising on those branded platforms will have a large influence on where marketing goes and it’s interesting to see that in action. It’s very interesting to see that research going on in action. One again, thanks for coming on the show Pat. Patrick: Thanks for having me. I’ve enjoyed it! Ander: Time for our next meeting.